Keeping the pace demands providing what is trending and respected by users with an eye on technological dynamism. Android caps the story of beautiful, durable, secured, and innovative design aimed at ensuring productivity, controlling performance, and providing security. Designed with three basic points of smartness, simplicity, and digital wellbeing, smartphones running on this OS will benefit the healthiness that sustains performance, and durability. Users will get to be excited and more relaxed than ever as more AI (Artificial Intelligence) has been applied to cut short repetitive actions that would normally demand concentration and consume time. So, What is Android P? 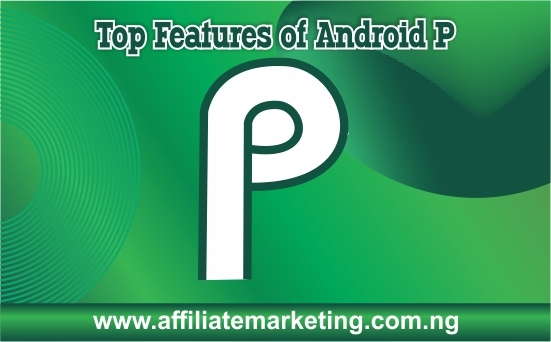 Android P is the next major upgrade of Android OS, officially termed Android 9 with great improvements and intriguing features to ensure smartness on smartphones. Android P combines user experience design features and optimisation to deliver well structured and in-demand operation of smartphones. While security has equally been given priority, the overall user experience of devices running this OS has been considered the most. With excellent UI designs, performance optimisation, cool battery management, and lots of exciting features to maintain the fun and entertainment. If you're like me, you'll be curious about what this OS will possess that others don't, or maybe its functionality and general operation that makes it better than previous versions. Indeed, latest releases of OSes are expected to display superiority to previous versions by addressing identified bugs and introducing new and user-compliant features. It appears Android has considered this in building their latest mobile Os, Android P, which is expected to be the next scale up version of the Android OS series. The top features of this dominant mobile OS have been described below. While some are simply an upgrade, others are completely new and reminiscent of the demand of modern technology consumers. A complete set of new and flexible navigation systems have been provided to ensure fluidity while moving around the various components of mobile devices. Adding to the excitement is the gesture notification while navigating. This provides a kind of feedback on how operations are being responded to by the device. You now have to swipe left or right to access recently opened apps depending on the order in which those apps were launched. This makes it convenient and faster to access most used apps and launch them for your use. 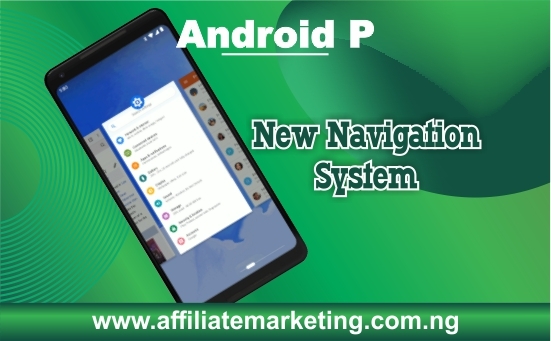 In addition, the navigation system delivers interactive, aesthetically pleasant and awesome interface that excites users as they move from one part of their device to another part. Common navigation hitches often encountered have been subtly eradicated with excellent user experience designs. I wouldn't completely say that Android P is 100% in performance as it's being tested. However, it features major upgrades and performance optimisation in contrast to previous versions. This is tied to Android's consistent drive to developed light-weight but cool apps to harness the overall performance of mobile devices. Well, you never have to worry or hire a tech expert to understand how to operate your smartphone provided it runs on Android P. Gone are most of the headaches experienced by users in trying to access or use some of the commonly used features on a smartphone. This OS has been expertly developed with special emphasis on simplicity, whilst maintaining the beauty that drives smartness. With smartphones gradually flooding the mobile industry, ensuring seamless use becomes a must, and this has been taken care of by interactive features, tooltips and information bars to guide users of all categories. Rounded corners have been introduced and added to almost every object to maintain the aesthetic appeal of the overall look. This is complemented by the high-quality graphics display enhancement features that deliver awesomeness. In smartphones, this is one of the top features to look out for when purchasing a smartphone or sourcing for an OS to use. Everyone often wishes a smartphone's battery can last for an amazing number of hours, especially during power instability and hectic periods of work. In Android P, we partnered with DeepMind to build Adaptive Battery which priotises battery power for he apps and services yu use the most, to help you squeeze the most out of your battery. Adaptive Battery combines with other power management features to give your smartphone's battery a healthy boost that keeps it functional for several hours, while you focused on making the most of your device. For lovers of Emoji, it's good news. Android P comes fully loaded with more Emojis. A total of 157 of these Emojis have been provided. Now you can express your feelings to friends and followers on social media platforms using these new additions. Though the existing Emojis are enough to express yourself, you might, however, want to try new additions. Existing Emoji have equally being improved to include couple features, gender considerations, and expressions displays. Just like a few other persons, this can simply show that you're keeping pace with the trends in the technological world and have the pockets to acquire devices that utilise the latest mobile Operating System. There are several improvements on Android P, and security and privacy happen to be one of such improvements made. For instance, it offers encrypted backups to protect backed up data by apps such as WhatsApp, protected confirmations for apps' access, Domain Name Services, and easy-to-use fingerprint and face sensors. Fingerprint and Face ID are emerging security technologies on smartphones that have attracted large usage. Most smartphone manufacturers consider integrating one or both features to tighten security. Combining Fingerprint sensor and Face ID systems provides a new security level to keep your device protected against unauthorised access. This keeps data and information safe. While security is the primary role of these two systems, with the fingerprint sensor, you can perform a number of functions quicker and smarter as earlier highlighted. Adaptive Brightness is one of the features that rely on machine learning powered by Artificial Intelligence to control the brightness of your screen based on preference and environments. This feature subtly learns how you prefer the brightness of your phone comparing with the environments to give recommendations on the setting that suits you. Using this feature contributes to the optimisation of the battery, as the screen isn't too bright in dark environments nor blurred in bright environments. Adaptive brightness generally controls the amount of light the screen radiates in some environments to allow for ease of reading the contents of the phone at any particular time. With this, Android has unfolded a first-timer innovative approach for managing and controlling the use of smartphones. This is more like the renowned membership portal on websites where you can set how your account behaves and responds to events and activities. This is not a website anyway. 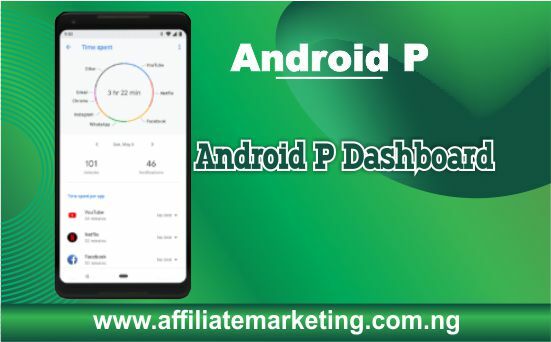 Google's idea of including the Dashboard feature to Android P is to reduce addiction levels to smartphones and provide control measures on the preferred number of hours a user can utilise a phone in a particular. Basically, it reveals how many times the phone is unlocked in a day, the number of notifications, time spent on apps, and hours spent in using it. Now you get to see how long you're using your phone to send messages, play games, stream YouTube and Facebook contents, browse the internet, make calls,, play music, and many other uses. This is most useful for setting restrictions and limits during times you are glued to work or something that demands zero distraction. Additionally, it provides a kind of parental control used to limit children from spending long hours on smartphones and smart devices such as Android Television, Wristwatches, etc. The smartness of Android P doesn't end with the above features alone. There are other really "cool" features that add excitement to these OS. for example, app timer does exactly what you expect and Do not Disturb saves you the noise of frequent notifications that can pull you away from something important and urgent. This is a sub-feature added to the Dashboard that helps you set the time limits on apps, and notifies you when you're close to the limit you've set. Once the limit is exceeded, the icon becomes grey, to remind you that the time set to use the app has reached or has been exceeded. This is indeed an exciting feature as you can easily control the number of hours you want to spend in apps in a particular day, especially social media apps that are known for gulping the bulk of the leisure time of smartphone users. This is not a new Android feature, it has rather been improved to respond to visual interruptions. Users of phones running on XOS Chameleon and HiOS will be familiar with this feature which allows you to silence phone calls, notifications, and pop-ups. This feature is now easier to use as a new gesture has been created to respond to the position of the screen. For example, when you turn the face of the phone down, it automatically activates the DND feature, thus allowing you to focus on other things. This can also be used to silence incoming calls without pressing any button. Wind Down is yet another feature that uses machine learning to help you manage time, and stick to schedules for the day. This feature will turn on Do Not Disturb, fade the screen to grayscale, and activate Nightlight when the day becomes dark. This equally uses user's preference based on the time set for bedtime. Android P introduces a new and flexible way of taking screenshots. Simply pressing and holding the power button and tapping the screenshot captures everything you need to capture on the screen. This provides a unique way of capturing screenshots. For those who have mastered the old way of holding down power and volume-down buttons, fear not! That former style is still available and can be used to screenshot. Adding to this is the available features for editing a screenshot. Once you save your screenshot, a preview notification which comes up automatically will display an Edit button. Once this button is tapped, editing tools will be displayed for you crop, resize, draw, and highlight the screenshot before sharing it. In Android Oreo 8, and Android Oreo Go Edition, Google introduced app shortcuts where you can downpress an app to reveal information about the app, and other commands like uninstall, remove, share and app details. App Actions shows the trend of actions that enable it to predict what your next move might be like. This hastens your actions as most of the predictions will normally be correct. For example, if you normally connect your headphone to listen to your favourite song using a particular app, App Actions will predict that you launch the app once a headphone is connected. You can confirm that by tapping the prediction to launch the app and play your favourite music. Android keeps getting better with each version released into the mobile phone industry. The goal has never changed or deviated as each version featured interested innovations for simplicity, optimisation, speed, security and artificial intelligence. Whether you are fan or not, Android P is blessing to all smartphone and smart device users. What now matters is when you will grace one of the devices that run on the new wonderful Android OS.